Lolz ! 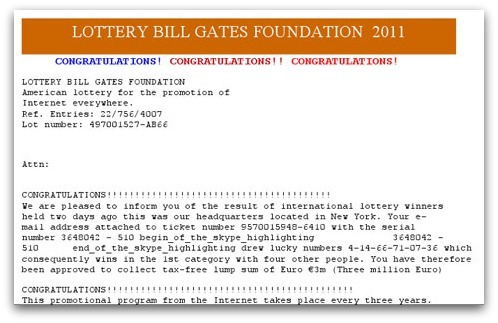 I've won three million Euros from Bill Gates ! Excuse me for typing breathlessly, faithful Naked Security reader, but I have some incredible news to share. I have just been informed that I have won three million Euros from none other than the Bill Gates Foundation! 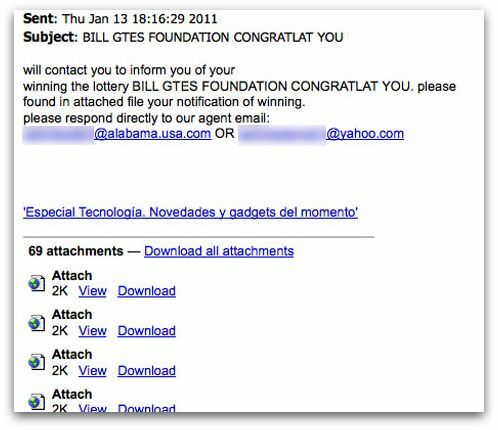 I had no idea that the Bill and Melinda Gates Foundation, which normally fights poverty around the world and promotes healthcare, even ran a lottery - let alone that I had entered. But clearly, I did and now one of their representatives has been in touch to tell me the good news. Bill and Melinda Gates are renowned around the world for their incredible generosity - they're not only planning to give millions away to me, but they're also happy to employ staff who spells the boss's surname incorrectly. It's great that Bill and Melinda are not adverse to employing people with literacy problems. All that they require is for me to share some personal information with them.. and then riches will be mine! So, this is probably going to be the last article that you'll see me writing on Naked Security. I'll be picking up my winnings and riding off into the sunset. I can't tell you how much fun it's been, but this is goodbye..
.. unless this is a scam, of course. But that couldn't be the case... could it? ?